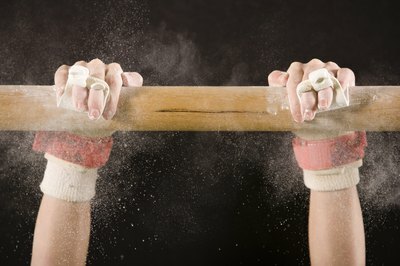 A layout flyaway is a basic uneven bars dismount. 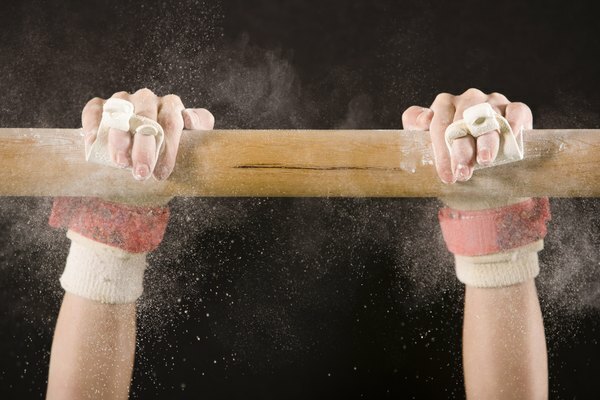 If you want to become a competitive gymnast, a layout flyaway off the uneven bars is an essential skill to learn. A layout flyaway is a somersault off the high bar, in which your straight body flips 360 degrees and you land on your feet. Because this element is done in the layout position, you shouldn't tuck or pike your body. To learn more difficult uneven bar dismounts -- such as double backs, double layouts or full twisting double backs -- you'll need to master the basic layout flyaway first. All it takes is plenty of practice and proper technique. Swing your body back and forth from the high bar to create momentum. Complete up to three swings. John Geddert, coach of 2012 Olympic gymnast Jordyn Wieber, instructs his athletes to keep their bodies in a scoop-like shape during the backward swing. When the swing moves the body to a vertical, the gymnast should prepare to hyperextend her body in the forward swing. Tap to bring your legs to about 45 degrees above horizontal. Use the force of the hyperextension to give you momentum. Don't forget to pay close attention to your form. Proper form will not only make your flyaway look more beautiful, but it will also help prevent injuries. Keep your knees straight and glued together and point your toes. Don't arch your back; instead, maintain a hollow position throughout. Your head should be neutral; don't pull your neck back or stick your chin to your chest. Release the bar right after your tap. If you feel more comfortable, you can use a coach to spot you at first. You can also practice the skill into the foam pit. When you release, your toes should point to the ceiling. Maintain a slightly hollow body position. Don't forget to keep your legs straight, lock your knees together and point your toes. Flip after the release. It's important to complete the previous step before proceeding. If you flip too soon, you could land short on the ground, risking a knee or ankle injury. Another mistake you could make is hitting your feet against the high bar when you're flipping upside down, says gymnastics coach Rick McCharles, sometimes resulting in even worse injuries. When you flip, focus your eyes on the ground to spot the landing. Land with your knees slightly bent, then straighten them out, raise your arms and salute.